Courses in Theology, Biblical Spirituality, Religious Life etc. Our stay in Mater Dei can be compared to a baby being formed in the mother’s womb for ten months. After being formed for ten months the child is prepared to see the world. Similarly after being prepared spiritually in the loving arms of the Mother of God for ten months we are being prepared to face life in a Theo-centric perspective. Life in Mater Dei was fun filled learning, deep interiorizing, hot group works, heart aching exams, light evening walks, relaxed weekends, joyful community living, challenge of our living together which made us think out of the box and led us slowly to face life with renewed vigour. The course was very enriching and it helped us to improve our personality and to build up a deep relationship with God and with one another. A wide exposure of the world of scripture, prayer and discernment, personality integration and classes on self awareness helped us to unfold our potentials, unite ourselves to Jesus, and explore our true self-image and to discover ourselves as unique persons with a unique world of experience. The study of the scripture indeed was an inner experience of deep encounter with the Lord. We were surprised at every moment of God’s incomprehensible ways which are a mystery not to be comprehended but to be lived and celebrated at every moment of our life and mission. Discovering the depths of God’s love for us we continued to explore and experience from the daily classes: new way of being the church, human rights and justice, theological anthropology, social teachings etc. which gave us a different approach and outlook in exploring possibilities suited to our mission. Classes on human sexuality, religion and dialogue helped us to get in touch with the reality more and more. As we walked through increased zeal and fortitude knowing that the hand of the Lord is upon us the classes on Eucharistic challenges, sacraments, moral theology, re-imaging the vows stirred us to walk onward with souls on fire. All the classes as a whole helped us to broaden our vision and enabled us to think differently. It also helped us to celebrate the differences through God experience of one enriching the other. Besides our daily classes we got weekend exposure to slums, home for the aged and differently abled children’s homes and to be part of the novena to St. Francis Xavier. On the 23rd of March we had a solemn thanksgiving Eucharistic celebration presided over by Rt. Rev. Philip Neri, Archbishop of Goa, and in his sermon he told us that we the IMD students were like Noah in the ark. Every Ark has its own challenges, storms, hardships and joys and that we are called to be happy religious in life. 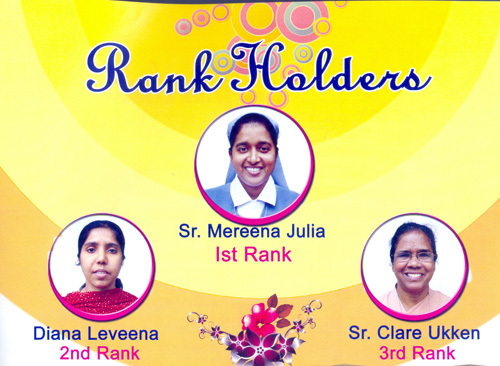 Our sincere thanks to Sr. Ancy and team for giving us this golden opportunity. We specially thank Sr. Emily and the sisters of the community of Goa for all their help, support and encouragement. Thanks to the community of Mumbai and New Delhi for the support. This is my “identity badge” which will tell you that I have been long enough (from August 2011 to April 2012). at the Divine retreat centre in Muringoor, Chalakudy to imbibe this spirit. We woke up at 5.20 in the morning to the sound of religious songs and bhajans springled generously with Alleluias and Praise the Lord. It fact, it was our rising bell. The whole programme was meticulously planned by the director of the Institute, Fr. Babu Vadakkekara, vc. Time was assigned for each activity: meditation, morning prayer, Mass, personal prayer, Rosary/stations of the cross, monthly recollection, confession, lectures, study time … Even after dinner we returned to the classroom for extracurricular activities like skit/speech competition, singing, discussion, etc. The day came to an end at around 10 pm except on Saturdays and Sundays. Since the place is known as a retreat centre many may not know that it also houses The Divine Institute of Bible and Spirituality where long and short courses are being conducted each year in English and Malayalam. The short courses are for 7 weeks and the long ones for eight months – all organized by the Vincentian Fathers. There were 47 of us who completed the course: 4 priests, 1 deacon, 19 religious sisters and the rest, laity belonging to different age groups (from 22 to 65) and backgrounds. 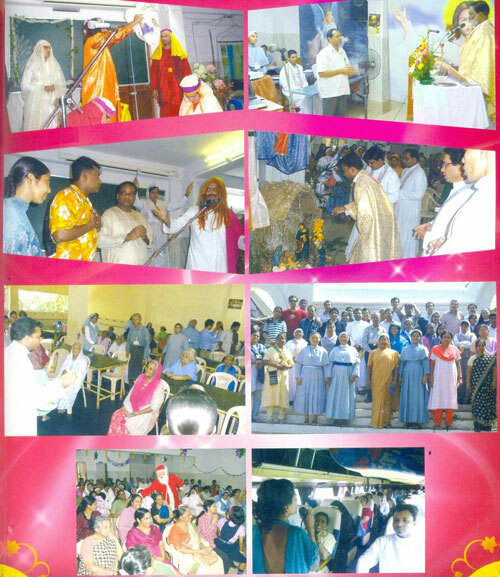 Some of the religious and priests are missionaries in India and abroad. There were participants hailing from 10 states including Manipur and Nagaland. Beginning from 2011 the Divine Institute of Bible and Spirituality is affiliated to the Calicut University, Kerala, so at the end of the course we were awarded a Diploma from the same University. The accommodation was arranged on a twin-sharing room basis, large rooms with attached bath. We met in the dining room five times a day. Food was abundant and nutritious. We had something extra when someone’s birthday or Congregation’s feast came around. The main thrust of the course was Bible: Introduction to the Bible, Salvation History, and the three main divisions of the Old Testament – Torah, Prophetic, and Wisdom literature. The New Testament, particularly the four Gospels and Revelation were given special attention. We had a written/oral exam at the end of each topic on the Bible. Other topics in the area of Spirituality were also taught but no exams. The professors were mostly Vincentian Fathers who teach in the Alwaye Seminary, Kerala. Others came from other religious houses and dioceses near and far. There were also lay persons among the teachers. Since some time I have desired to attend a course to deepen my knowledge of the Bible and thus enrich my own spiritual life. In fact, my reason for joining this course is clearly expressed in Colossians 2:6-7, namely “As you therefore have received Christ Jesus the Lord , continue to live your lives in Him, rooted and built up in Him and established in the faith … abounding in thanksgiving.” Many ask me: How was the course? I must say, my expectations are realized to a certain extent. I have grown in love for the Word of God, gained a deeper appreciation of the role of the Holy Spirit in my life and a greater devotion and love for the Holy Eucharist. I realize what great gifts these are. So my heart overflows with gratitude to God and to you my dear sisters. First of all to Sr. Ancy and the provincial government who readily agreed to my request and then, all of you, sisters particularly of my community and department who made it possible for me to be absent for months. I remembered and prayed for you often.